Here's my card for the current My Favorite Things Wednesday Sketch Challenge, once again just before the challenge comes to an end. 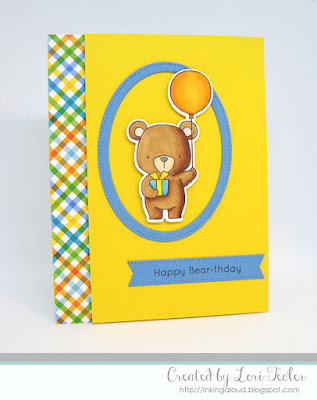 I used the layout and the Beary Special Birthday stamps and dies to create a child-friendly birthday card. The cheery color scheme for my card came from the scrap strip of patterned paper placed along the left edge of the cardfront. I paired the plaid with a sunny yellow cardstock panel and a blue pierced oval frame. After I colored the balloon-holding bear image with Copic markers and cut it out with the matching die, I used foam tape to position the bear inside the oval frame. I stamped the set's "happy bear-thday" sentiment on a blue pierced fishtail flag strip and adhered it to the cardfront beneath the framed image. The yellow panel was placed on the cardfront using foam tape to give the design dimension while keeping it easy to mail.